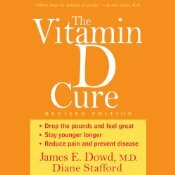 Completely updated with the latest research, The Vitamin D Cure tells you all you need to know about this miraculous natural substance - today's best way to heal pain, prevent disease, and improve your mood. Adding vitamin D to your daily regimen can net you unbelievable benefits, from reducing your chances of having certain kinds of cancer to gaining flexibility and youthful exuberance well into your seventies and beyond. And no, a dose of daily sunshine doesn't give you enough!